I killed the keg of Chocoloate PB Stout last night and now I need to clean the keg lines again. Previously I filled my keg with water and cleaning solution, pressurized the keg, and ran the keg through the tap line a couple times. It was a bit of a pain and definitely wasted a lot of CO2. In fact, today I also had to refill my CO2 can. I think I managed 4 kegs on a 20lb CO2 canister which seems like way too few kegs. I suspect there might be a CO2 leak somewhere in my setup as well. 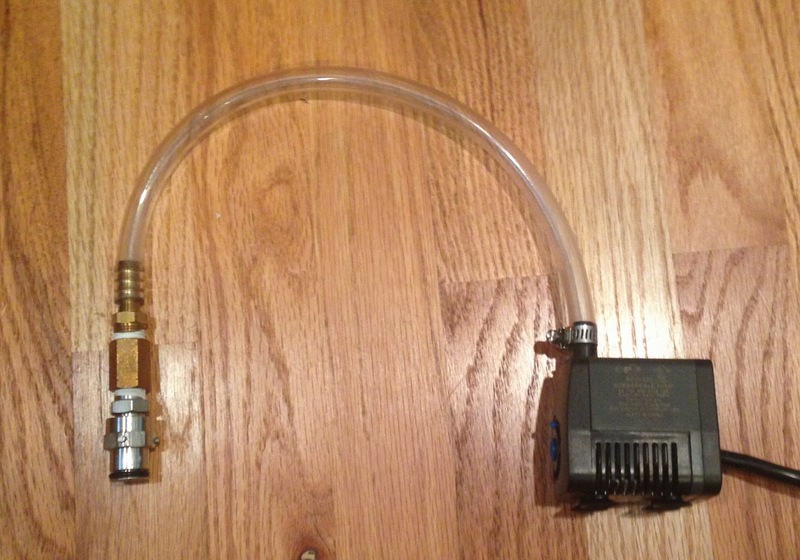 Anyway, today I ordered the parts to make a re-circulating keg cleaning system. It looks pretty straight forward thanks to brewonabudget.com guide. I am copying his parts list here just in case his page goes away. You should go use his page and links (if he gets referral $$) because this was his post originally. Plug Adapter 1/4" MPT to 19/32"
That's a lot cheaper than the handpump thing they have at midwest supplies and this should work even better since I can connect my quick disconnect right to it! I'll post a follow-up once I've assembled and tried it out.